Wishing you all a very Happy and Colorful Holi! This year we celebrated with Gulal (Pink Colored Powder) and a favorite Holi drink - Thandai! We usually also make Puran Polis, the gluten free version is posted here. 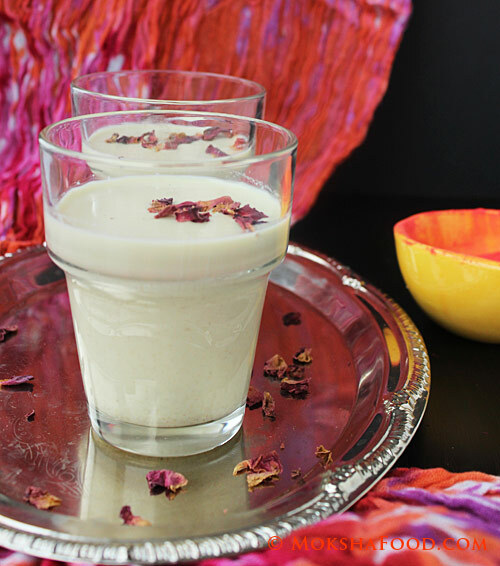 Thandai is a concoction of milk with almonds and flavored with fennel seeds, cardamoms, saffron and rose. Thandai literally translates to Cooling Drink. The Month of March usually has temperatures rising in India so this drink helps to cool down the body heat. Thandai is also very nutritious and high in protein. It can be easily converted into vegan by replacing milk with almond milk or alternative non dairy sources. My daughter who has been raised in North America, has recently jumped on the crazy Holi bandwagon. She has seen it in Bollywood movies and pictures and heard my childhood stories. She sorely misses the fun of smudging the holi colors on everybody's faces and drenching them with water. So to give her an experience this year, She and I played holi indoors with half my apartment now tainted pink. The aftermath was many hours of cleaning up but it was worth all the fun we had. Hopefully someday we can go to India and play holi there and make some awesome memories. 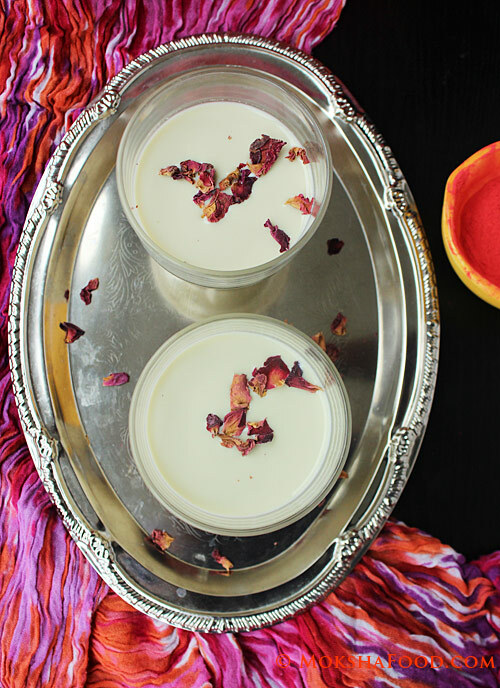 Thandai recipe has been adapted from Tarla Dalal's website. Soak the Thandai spice mix in about 1/2 cup of water for about an hour. De-skin the almonds and grind the mixture to a smooth paste. Heat the milk in a large saucepan. Once its warms up, take 2-3 tablespoons of milk in a small bowl and add the saffron strands. Crush the saffron strands gently with the back of a spoon to release their flavor and color. Add the sugar to the milk and stir till it has dissolved. Add the Thandai spice paste and mix well. Pour in the saffron milk. Switch off the heat and let the milk cool down to room temperature. Refrigerate for 3-4 hours or better overnight to let the flavors develop. At the time of serving, strain the milk through a strainer . Serve chilled garnished with rose petals. If you don't mind a slightly coarse texture, you can drink the milk without straining it. More fiber and nutrients for you. You can also add other nuts along with the almonds.